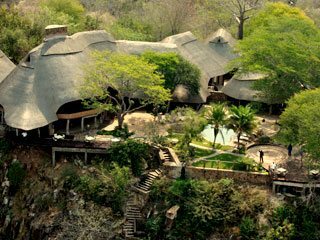 The family-run Gorges Lodge has a stunning setting 200 metres above Batoka Gorge on the Zambezi River. The family-run Gorges Lodge has a stunning setting 200 metres above Batoka Gorge on the Zambezi River. Just half an hour’s drive from Victoria Falls, the lodge offers a free return shuttle and 2 complimentary activities each day. As well as exploring the Falls you can visit the local village and school, take a guided walk in the gorge, watch black eagles and take an enchanting cruise on the Zambezi at sunset. In between you’ll have time to relax in the lodge, admiring views of the gorge from the viewing deck where you may be treated to a flying display by some black eagles so be sure to have your camera to hand. You can also snuggle into a sofa in the lounge, chatting to other guests, checking emails or browsing through a book. At nightfall a large fire is lit in the garden and regular barbecues are served here in the open air, often accompanied by traditional dancing from a local group. Breakfast in the dining room usually coincides with the sunrise. At the opposite end of the day sundowner drinks are served in the bar. There’s an attractive swimming pool where you can cool off, and a shop stocking a varied selection of handicrafts. Each of the 10 chalets is set in its own garden. Interiors are elegant with framed wildlife paintings on the walls, polished wooden furniture, fluffy rugs and fresh flower arrangements. Ceiling fans regulate the air temperature. Bathrooms have stylish porcelain basins and rain head showers. Verandas are high above the spectacular gorge and you can sit here sipping a cup of coffee or a drink from the minibar as you admire those views, maybe catching a glimpse of some whitewater rafters as they shoot the rapids far below. Children aged 7 years and over are welcome. Children under 7 are accepted by special arrangement. The twin storey suites can accommodate up to 2 children, in the dressing room.